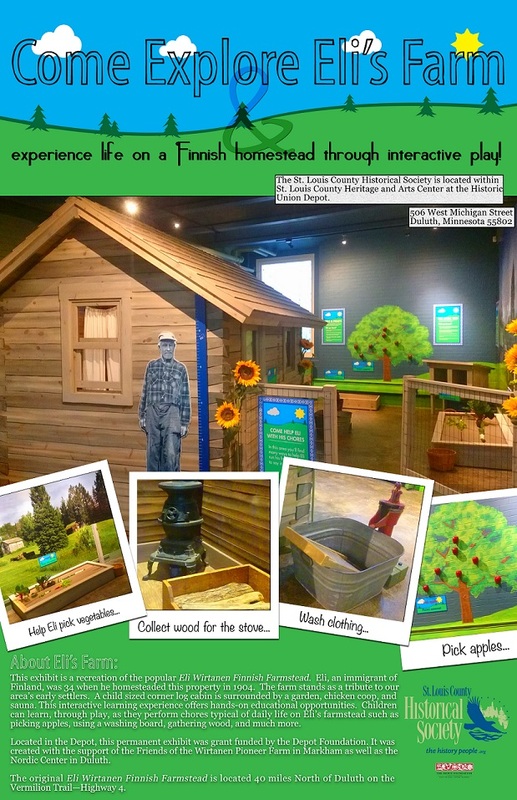 This exhibit is a recreation of the popular Eli Wirtanen Finnish Farmstead. Eli, an immigrant of Finland, was 34 when he homesteaded this property in 1904. The farm stands as a tribute to our area’s early settlers. A child sized corner log cabin is surrounded by a garden, chicken coop, and sauna. This interactive learning experience offers hands-on educational opportunities. Children can learn, through play, as the perform chores typical of daily life on Eli’s farmstead such as picking apples, using a washing board, gathering wood, and much more. Located in the Depot, this permanent exhibit was grant funded by the Depot Foundation. It was created with the support of the Friends of the Wirtanen Pioneer Farm in Markham as well as the Nordic Center in Duluth.